This "Tropical Paradise" is located on the west end of Panama City Beach. This is the quiet and family oriented end of Panama city Beach. This "Tropical Paradise" is a great family vacation spot to make memories that will last lifetime. It is a 3 Bedroom 2.5 bath family dream house. One of the bathroom offers a Jacuzzi Bathtub for 2. It can easily make for a great family vacation or a romantic getaway for those wanting privacy. It will accommodate a large family or invite others to join you and split the cost. The outside is easily accessible without disturbing others. The side and back yards are fenced in with the pool in the same area. Step right off of the porch and step right on the pool deck. So you can lounge around the pool and still watch children playing in the yard while grilling out and making memories. This unique property has everything that you could want with pool and directly across the street from the beach. Plus it is Reasonably Priced. What more could you ask for? I have been renting this house along with others for 15 plus years. I live here in Panama City Beach and can help you with most of your needs. I live about 5 miles east of this property. This property is located directly across the street from the beach and the beach access (#95). 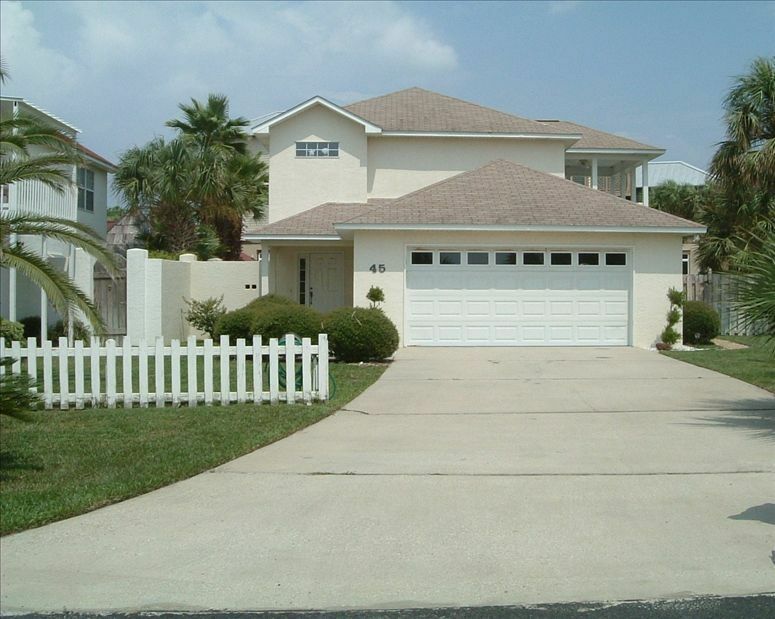 It is located on the more desirable west end of Panama City Beach. This is the quite, family oriented part of Panama City Beach. No busy road to cross, no hi rises to contend with and all the people that come along with them. Just good family fun. Property has private pool and back yard for the kids to play in and the family to enjoy there time together. Also located in a gated community of only 45 properties. This property was in a great location. The owner was super helpful, friendly and very prompt returning calls/texts! Do not rent this house! I stayed in the house with my son and daughter-in law. It is in horrible condition. There is mold and mildew everywhere...in one of the bathroom and the door frames. There's black stuff hanging from the return vent in one bathroom. The base of the cabinets are rotting out. The ceiling fan on the deck is so rusted, it looks like it's going to fall down any minute. The table on the deck is so rusted with metal peeling up, it's a serious safety hazard. The column on the front of the house is rusted. The fence is the yard is rotting also. Don't expect the usual toiletries like soap to be there. The pictures on this site don't show all the problems. I would caution anyone from renting this house until all the safety hazards are corrected. Overall, this place has so many serious problems, the owners should be ashamed to rent it in the condition it is now. I wish I could post pictures I took. Hello, I normally don't like to respond to this kind of review but I want to take the time to do so. The smartest thing to do when you rent a property from me or anyone else and you are not happy with it for any reason is to notify the person who you rented from immediately and let them know you have a problem with it. If you rent a property from me and you are not happy with it i will move you to a different property if possible, if i cant I will be happy to give you a refund. This is what this person should have done since they were not happy with this property. The group that was in the house before this group was has already made reservations for next year and one of the groups after has also. Now to address the issues at hand. The mold issue on the door and shower. The shower has been re grouted and resealed and the door and frame taken out and cleaned. The ceiling in the shower has also been repainted. This was due to it needed it and no due to mold. The black stuff hanging from the return air vent in the bathroom. There is not a return air vent in the bathroom, if there was then your bathroom smells would be going all over the house. However there was some dust on the exhaust fan and it has been cleaned. The cabinets were not rotted but due to water the wood was discolored. So all that being said the bathroom has been completely redone from he ceiling to the floors. We repainted the walls and the ceiling, installed a new vanity and top and sink. We also put all new tile down and a very nice shower surround was added to the shower. Also install a new and more handicap assailable toilet. Also new Vanity light fixture. The bathroom has been completely redone and updated. Now to the ceiling fan and table rust issues. Both have been replaced as they are ever year due to the salt air and it does take its towel on things like this. So they are new and ready to go for another year now. Now to the column on the front of the house. It is a stucco house and the columns are also stucco not metal. Stucco can not rust. It is stained from the sprinkler system that waters the grass. one of the heads got turned wrong and stained it. Again not rust. The fence was being torn down when this group was here and we stopped working on it while they were here not to disturb them. The fence has been replaced by a new and updated style fence. To make this a short story. The house has been repainted and all new tile on the first floor. Updates pictures coming soon. We rented this house for a weeks vacation. We had a group of 10 people (2 families) and were very pleased with the house! It had a pool which was very nice! The location was good and convenient. It was far enough away that we could avoid the busy traffic, but close enough to get to the grocery store, Waffle House, and a few other locations without having to travel very far. Jeff was extremely nice and attentive and answered any questions that we had. The beach was right across the street making it very easy to access. We had an amazing time and will definitely rent again from Jeff. We had a group of 10 (ages 2-31)and we had lots of room. We'll never stay in a condo again! The house was very clean and in good shape. This house is on the "Family end" of front beach road so its not busy so walking across the street to the beach access isn't a problem. Having our own pool yard was a plus with us. Make sure to check pool in the morning for ghost crabs. We did have 2 that decided to take a swim. HAHA! We just got the net and sent them on their way. There is a grocery store and gas station just a minute away which is great or you can drive 10 minutes to a wal-mart. The house did have a gas grill which we really enjoyed. . The owner Jeff was great! He answered all my questions and he came by to check on the pool. We''ll be staying in this house again the next time we go to PCB! My family of five (mom, dad, tween, teen & grandmother) has been staying at this house every summer for the past 5 years now and it is by far our favorite house in PC. It's the perfect location for families who want to be away from the hustle and bustle of Pier Park but close enough to drive to in a few minutes. Access to the beach is a mere 30-second walk across the street. The furnishings make it very homey which is a huge plus. The laundry room is an actual room, not a closet, and is stocked full of extra bed, bathroom and kitchen linens -- YES! The kitchen, also fully stocked, has all the amenities of home with plenty of room for actual cooking -- another YES! The pool is always clean and Jeff stops by regularly to tend to it rain or shine. We also appreciate that there's no wi-fi, we don't want our kids to be "plugged in" while on vacation...they do that enough at home 😀. I really can't say enough good things about the house and owner...we'll never stay anywhere else! Wonderful getaway! This is our second stay at this beach house in the past two years, and even though it rained this time, we love it. We share the house with two other families when we come here, and it's wonderful. Plenty of room, great layout, and you can see the beach from the top deck. We love that deck. The private pool is wonderful for us because we have small children, and it has a yard, which is hard to find in a rental. It is very clean and comfortable. We were talking tonight about booking for our trip next year. We would recommend this house to anyone. And the beach access is directly across the road. It's the perfect house! Thanks Jeff for sharing your house with us.